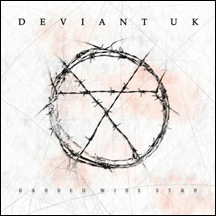 Originally released in 2006, Barbed Wire Star was the debut release from Deviant UK. The album was met with critical acclaim as songs such as "Access Denied" and "Raptured Saints" quickly gaining club and radio play across the globe and earning the band a solid following among the EBM, Industrial and Gothic genres. Previously unavailable in North America, Barbed Wire Star will be available as a digital only release.